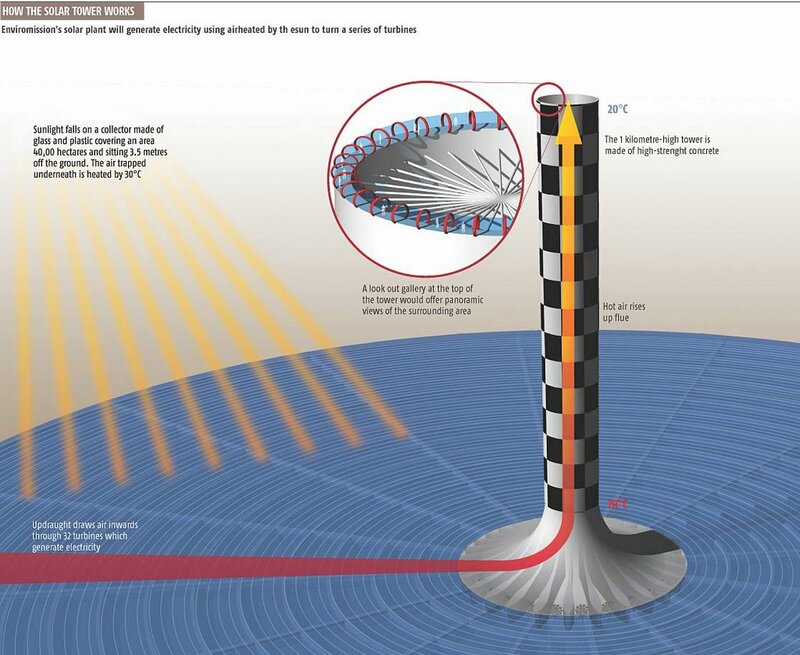 If built, it will be “Australia’s biggest solar power plant,” a kind of chimney for hot light. And if it sounds novel – it isn’t. “People have been harnessing the energy of rising columns of air for centuries,” we’re reminded. 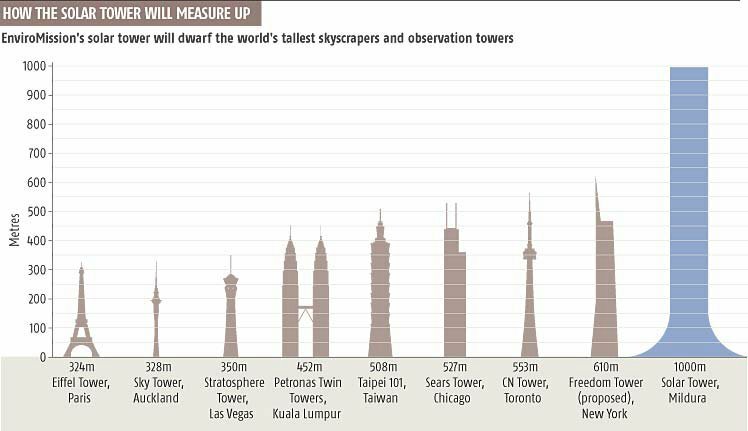 On the other hand, nothing is without its difficulties, and concerns of basically any kind at all are not holding back the scientists behind this and other so-called “mega-engineering” projects. Global warming? We’ll just build huge mirrors, or use reflective balloons, to bounce all that extra solar energy back into space. 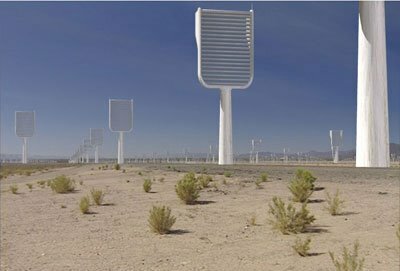 Installation art as climatic engineering. Or vice versa. One wonders what else is under consideration. How about the giant space-mirror? 3000 tonnes of shield – is not a phrase you read very often. Latham, we read, “calculates that doubling the number of droplets in clouds over all the world’s oceans would shut down several decades of global warming. Ingeniously, he proposes doing this by deploying giant wind-powered machines” – one of which “looks rather like a giant egg whisk” – “to fling salt spray from the sea into the air.” (Incredibly, this machine was designed by a man named Salter). Then there’s Klaus Lackner, recently featured in the Alanis Morissette-narrated “Global Warming” TV special. Lackner is a scientist at Columbia University, and he has proposed the construction of massive “forests” made from synthetic trees. According to Lackner, each synthetic tree would look “like a goal post with Venetian blinds,” not like a tree at all. 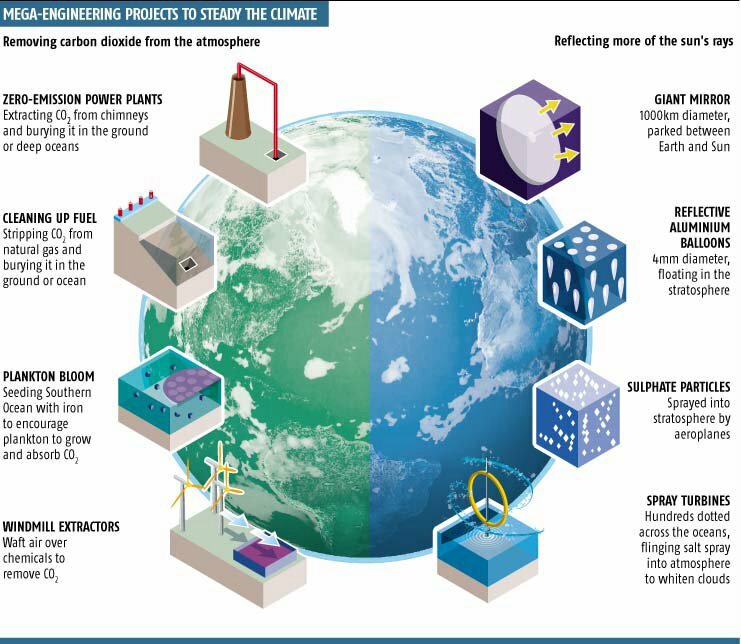 [Image: Columbia University Earth Institute]. The catch is that you would need at least 250,000 of these “goal posts with Venetian blinds” studded all over the earth, located inside cities, standing like optical illusions receding over the horizon. (Smaller, domestic versions are under consideration). In any case, all of these eco-friendly (or almost) mega-projects are barely a fraction of the actual proposals out there, passing from one desk to the next, being sent via email from one mega-engineering firm after the other, getting filed away or submitted to venture capital firms. Yet I’m tempted to issue a call of sorts here: that any BLDGBLOG reader who gets a kick out these ideas – building artificial, carbon-absorbant forests, for instance, or the giant space-mirror (I like the tiny balloons) – should perhaps scan the classified ads each week to see if war-profiteer/engineering firms like Halliburton, Anteon, Northrop-Grumman, and their ilk are hiring. Then get a job there, work your way to the top, and pull out of the war industries altogether. Start building solar towers, and absorbant forests, and, while you’re at it, pump millions of dollars into modular architecture and prefab housing, not for more military training villages, but to build refugee camps and post-disaster instant cities, realizing the goals of Archigram, Greenpeace, and Architecture for Humanity, all at once. (And if you have your own mega-eco-ideas… leave a comment, below). This is the show I saw, and mention above, as narrated by Alanis M.
$10/ton CO2 sequestered * 20 billion tons co2/year = $200 billion! Maybe us scientists aint so dumb after all. There is a great way to keep that greenhouse glass clean, its a silicon adhevise coating that will make the surface of the glass an almost frictionless surface, thereby allowing dirt and dust to slide off. I know Ive washed over 20k windows. Believe me I know glass. We have thousands of miles of roads all around us. We see them, use them, abuse them everyday. Why not, develop rollers to be embedded inside these roads. Every time a vehicle passes, the rollers are set into motion and we harness energy. Have a large number of these, Road-Rollers working in tandem and we have ourselves a efficient little energy-farm. The pros here are that we will definitely have an unlimited supply of vehicles thronging as far as the human eye can see to put our rollers into motion. The rollers can also be substituted with small speed bumps, operating like push and pull buttons. Every time a vehicle cruises through, the speed bumps are pushed/pressed into the road itself, where they are connected to an elaborate network of hydraulic springs to produce energy. As the weight of the vehicle is lifted off, and the spring releases its energy, the speed bump returns to its initial position, only to be pumped by the next vehicle. The safety of vehicles will depend on making the speed-bump protrude just the right amount above the road level.